Modern Aboriginal, a photo by The Bacher Family on Flickr. One of the more outrageous groups to participate in the annual Gay Pride Parade in Seattle is the "Body Pride Ride," promoting body acceptance and pride in a culture that is more comfortable with body phobia and shame. 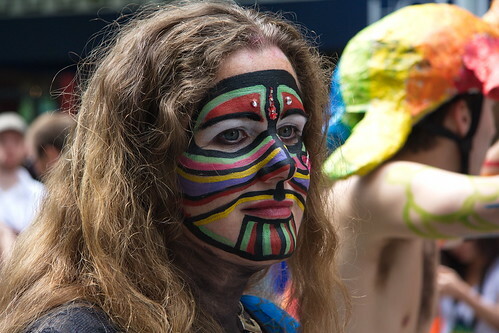 They spend the two hours of the ride dressed entirely in body paint, riding bicycles through the crowd-lined streets of downtown Seattle. They make a very colorful group to photograph!